The crowd looks on as Cynthia Pelayo reads from THE MISSING. John Everson reading “The Pumpkin Man”. Reading from THE BLACKENING OF FLESH. I hope you had as great a time as I did. (The Cubs win certainly helped.) 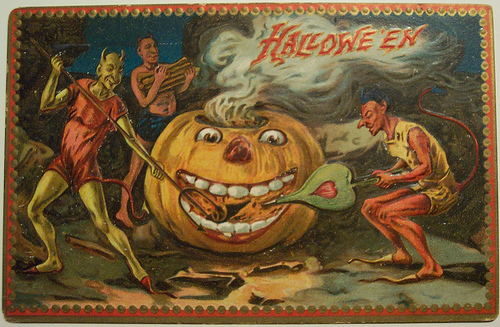 Whether you were able to make it out last night or not, I hope you have a horrific terrific Halloween! It’s Halloween weekend, baseball fans! What are your plans for Sunday? If you don’t have a copy of THE BLACKENING OF FLESH yet, I’ll be signing copies on Sunday from 5:00 to 7:00 PM at The Harp & Fiddle in Park Ridge for their “Halloween Eve” reading event with Cynthia Pelayo (THE MISSING) and John Everson (PUMPKIN MAN). Everson, Pelayo, and I will each be reading short selections from our novels while you eat, drink, and mentally prepare yourself for Game 5 of the World Series, which–wouldn’t you know it–you can watch right there at The Harp & Fiddle on Sunday night. First pitch is 7:08 PM, so you can load up on bangers and mash and scary stories from Chicago horror authors before you settle in for the baseball game. Here’s your invitation, and you can scout their menu by clicking here. With Wrigleyville bars charging as much as $1250 to eat and drink with your fellow fans, The Harp & Fiddle is a no-cover bargain with a unique Sunday night pre-game you’ll never forget! Cubs in Fall Classic; where will you watch (a potential) Game 5? Unless the Cubs (or Indians) sweep, game five of the World Series will be played at Wrigley Field on Sunday, October 30th … the night before Halloween. First pitch is set for 7:08 PM with a probable pitching matchup of Cubs ace Jon Lester versus the Tribe’s Corey Kluber… and it could be an elimination game. As a Cubs fan, how do you spend the last couple of hours leading up to that matchup? By listening to horror stories at The Harp & Fiddle in Park Ridge, natch. You’re invited to Halloween Eve at The Harp & Fiddle from 5:00 PM to 7:00 PM, featuring stories from Bram Stoker Award®-winner John Everson, International Latino Book Award-winner Cynthia Pelayo … and I’ll be reading from my ghosts and gangsters novel, THE BLACKENING OF FLESH, just minutes before Lester (probably) takes the bump. When the read wraps up, settle in and watch some history-in-the-making at The Harp & Fiddle (if the first four games are split in any way). With two dozen beers on tap and brand-new TVs and surround sound, you can share the evening with your fellow fans. And let’s be honest: being a Cubs fan is a social thing—a thing lifted between friends from one generation to the next since Ulysses S. Grant was in the White House. The first team photo. Jimmy Wood (sixth from left) later stabbed a zit on his leg with a pocket knife and had to have it amputated. The leg. Not the zit. So call your buddies. Gather up the family. It’s the World Series and anything can happen, but if there’s a Game 5, watch it at The Harp & Fiddle in Park Ridge. Even if there’s a sweep, though, here’s a surefire bet: there will still be scary good times on Halloween Eve with John Everson, Cynthia Pelayo, and THE BLACKENING OF FLESH. I’ll see you there, starting at 5:00 PM. No tickets necessary, but bring money for food and drinks … and maybe a couple of books! “Bast” was originally published in WHAT FEARS BECOME, but you can read it right now, for free! And be sure to check out the other great stories in The 2nd annual Parlor of Horror Best ‘Free Read’ Halloween Horror Stories contest! Halloween’s coming, but the spirits … they’ve already arrived. It’s the Milwaukee Paranormal Convention, and it’s happening this weekend at the UWM student union. I’ll be there on Sunday among the ghost hunters, cryptozoologists, and UFO experts, signing copies of THE BLACKENING OF FLESH about a teenager who’s house is haunted by five Prohibition-era gangsters. But I won’t be the only author at the table. Authors Dawn Napier and Christine Verstraete will also be inking their latest releases. Napier is the author of BLACK BELLS, the story of a woman who has to face the incarnation of her childhood fears in order to save her daughter, who’s gone missing. A child in danger cuts to the quick of our most basic fears, but if you’re looking for some adventure without the creeps, you might want to check out Napier’s MANY KINGDOMS fantasy series (DARK RANGER; A FIRE OF THORNS; and WORLD OF DRAGONS, WORLDS OF MIST), a perfect hat trick during this treating season. Verstraete, author of GIRL Z: MY LIFE AS A TEENAGE ZOMBIE, will also be personalizing copies of her latest work, LIZZIE BORDEN, ZOMBIE HUNTER, which puts a new spin on an old mystery: what if Borden did it … because she had to? Borden experts should love this new take, but if you’ve never even heard of Borden before, I’m sure you’ll find it’s a great entrance point to this head-scratcher of a case. If you liked ABRAHAM LINCOLN: VAMPIRE HUNTER, then I’m sure Verstraete’s Borden book will be right up your alley. The Milwaukee Paranormal Conference happens this weekend at the University of Milwaukee Student Union from 10:00 a.m. to 5:00 p.m. on Saturday, and 10:00 a.m. to 4:00 p.m. on Sunday. Passes start at just $10, and include access to the vendor room, guest speakers and panels, workshops, media demos, activities, and a “ghost story” open mic. I get the feeling Halloween will be feeling a little big jealous this year. You don’t want to miss this. Especially Sunday. See you there! Halloween Eve at The Harp & Fiddle is a real thing now—it’s even getting press. The Park Ridge Journal & Topics is reporting on the Halloween-appropriate reading event featuring John Everson, Cynthia Pelayo, and me. The event is free and if you’re reading this, you’re invited. You don’t even need a ticket, but you might want to bring a few bucks for food and drinks, and we’ll all be signing copies of our books for our readers, too. It was Halloween 1987. My best friend and I decided to trick or treat across Park Ridge to my grandparents’ house two-and-a-half-miles away. They didn’t know we were coming, but I knew they were home. When we finally got there, though, they pretended not to be and finally turned us away by setting off their own burglar alarm. We ran away thinking we had really tripped it, but only for about 30 feet. Running makes you look guilty. I think that might be my favorite Halloween memory from childhood. Thanks, Grandma! Park Ridge gets its Halloween on a day early this year, as Bram Stoker Award®-winning author John Everson reads a short selection October 30th at The Harp & Fiddle at 110 Main Street between 5:00 and 7:00 p.m. Everson grew up in the Chicago suburbs, graduated from the University of Illinois, and edited the Illinois Entertainer for several years before establishing himself as one of horror fiction’s biggest 21st century draws with works like COVENANT, NIGHTWHERE, and THE FAMILY TREE. International Latino Book Award-winning author Cynthia Pelayo will also be reading at the event on Halloween Eve. In her latest novel, THE MISSING, a Chicago woman visits Mexico in search of her previously unknown half-sister, and she must decide whether or not to enlist the aid of the saint of death to save her from one of the world’s most ruthless drug cartels. THE MISSING is the sequel to 2013’s SANTA MUERTE, now available from Post Mortem Press in paperback and Kindle formats. I’ll also be reading that night from THE BLACKENING OF FLESH, a story about a teenager who’s house is haunted by five Prohibition-era gangsters. The book is set in Park Ridge (or a fictionalized version, anyway), including a chapter or two in a pharmacy inspired by the former Scharringhausen’s at 110 Main Street—where The Harp & Fiddle now stands. So it’ll be a bit of a homecoming for the main character, Jared Dix. Same goes for me. I used to buy Luden’s cherry cough drops there before catching movies at the Pickwick. Celebrate Halloween Eve at The Harp & Fiddle. Besides the short readings between 5:00 and 7:00 p.m., they also have a terrific menu of Irish-American fare, 24 ice-cold beers on tap, and plenty of big screen TVs to watch Philly at Dallas … or maybe Game 5 of a certain Fall Classic involving a previously cursed entity from Chicago’s north side. So clear your calendar and make plans to attend Halloween Eve at the Harp & Fiddle. It’s free to get in, but bring money for food and drinks … and maybe a book or three. You are currently browsing the exlibrislarsen blog archives for October, 2016.